Welcome back to the dance, Bucknell. The Bison punched their ticket to the Field of 68 by beating Lehigh in the Patriot League title game Wednesday. Bucknell is dancing for the first time since 2013 and is now looking for its first NCAA Tournament victory since 2006. CLEMSON: See ya, Clemson. Duke, despite getting zero points from Grayson Allen, put the proverbial nail in Clemson's NCAA Tournament coffin. A team can't go 6-12 in ACC play, lose in the ACC Tournament second round, finish the year 17-15, and even hope the selection committee calls its name. Period. TCU: The Horned Frogs snapped a seven-game losing streak by beating Oklahoma in the Big XII first round. In improving to 18-14, TCU needs, at the very least, to beat Kansas in the quarterfinals to think about dancing. 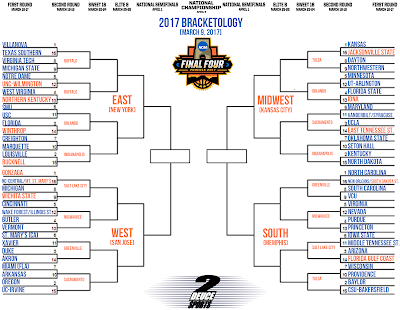 More than likely, a trip to the finals (which would require a win over Oklahoma State or Iowa State as well) is necessary to get on the right side of the bubble. TCU just has too many losses at this point. SYRACUSE: Need a sweat cloth, Syracuse? Probably, due to your 62-57 loss to Miami. Now, Miami is a solid NCAA Tournament team (likely in the 7-9 range), but the Orange proved once again that winning away from the Carrier Dome is a big problem. It has been well documented that Syracuse has six Top 50 wins, but remember all those wins are at home. That doesn't mean they should be discounted, but it is only one factor the selection committee reviews. Others like nonconference strength of schedule (NCSOS) - Syracuse is hovering around the 200s now - and road/neutral W-L record are factored into any decision. Last but not least, overall record has to play a role. Syracuse will be sitting with an 18-14 record on Selection Sunday. Will the home wins be enough? WAKE FOREST: Like Syracuse, Wake Forest is one of the "Last Four In" teams. In contrast, Wake Forest actually played a decent nonconference schedule and doesn't have an RPI in the 80s (it's in the low-30s). The Demon Deacons have a great shot at hearing their name called on Selection Sunday, but Wednesday's loss to Virginia Tech in the ACC Tournament makes it a longer wait. This is definitely a team's resume that will be examined in depth over the next few days. MICHIGAN: The non-basketball story that made headlines Wednesday was how Michigan's plane was involved in an accident before takeoff. Thank God everyone was okay. Nevertheless, many people - players, coaches, and family - were, and probably still are, shaken to some degree. The basketball side of the story is this: Michigan is slated to play Illinois in the Big Ten's 8/9 game at noon tomorrow (It's the Big Ten's first quarterfinal game). There are no plans to push back the game time (TV rules, people), and Michigan was planning on leaving extremely late Wednesday or Thursday morning. Not the ideal situation for Michigan, naturally. CALIFORNIA: The Golden Bears might have to win the Pac-12 Tournament, or at least reach the finals (with additional wins over Utah and Oregon) to reach the Big Dance. Wednesday's win over Oregon State didn't help matters, but Cal avoided a devastating loss.